GEOFFREY E. JACOBS is an associate attorney at GWC, where he works in the firm’s Litigation division. Geoffrey grew up as the son of a personal injury attorney in Long Beach, California. From an early age, he recognized the positive impact his father had on the lives of his clients as they went through very difficult times. Since that time, Geoffrey has sought to emulate his father’s work by helping others. 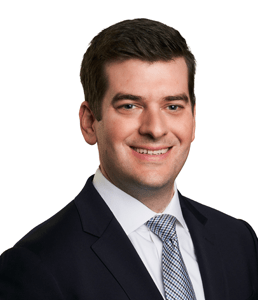 After graduating from DePauw University in 2009 with a bachelor’s degree in History, Geoffrey attended The John Marshall Law School, where he earned his Juris Doctorate. As an attorney, Geoffrey has dedicated himself to helping those who have suffered personal injuries. He is an active member of both the Chicago Bar Association and the American Bar Association. In his spare time, Geoffrey enjoys horseback riding, fishing, and watching the Los Angeles Dodgers.